pairList is pair Networks' mailing list service that runs on the GNU Mailman software. You can use pairList to send email newsletters or to set up mailing lists that allow for comments from subscribers. 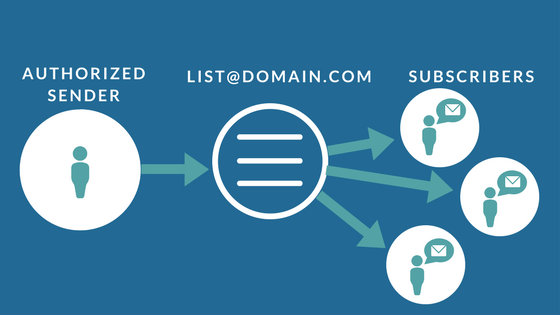 When you create a new pairList, a new list address is created, for example, list@domain.com. Authorized senders can then compose a message in their normal email client and send it to this list address, list@domain.com. The message then gets distributed out to all those who have subscribed to list@domain.com. How are new lists configured? By default, new pairList mailing lists are configured as announcement-only lists. Only authorized users can post to announcement-only lists. Discussion mailing lists allow all list subscribers to post comments to the list. To configure a discussion list, see our instructions below. How many pairList mailing lists do I receive with my hosting plan? You receive a certain number of pairList mailing lists depending on what pair Networks hosting plan you choose. The allotment for each hosting plan can be found in the Account Control Center by clicking your username in the top right-hand corner of the screen and selecting Your Hosting Package Details from the drop-down. You can use more than your allotment but have to pay a $5/month fee per additional list. Can I use more pairList mailing lists than my hosting plan includes? Yes, you can use as many pairList mailing lists as you like. However, if you use more mailing lists than your hosting plan includes, you'll have to pay an additional $5 per month per mailing list over your given allotment. Is there a limit to the number of subscribers I can add to a mailing list? 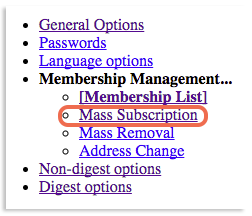 Yes, pairList mailing lists are only allowed to have 10,000 subscribers. If you require a list with more subscribers, please contact our friendly Support Technicians at pairlist@pair.com. How do I manage my pairList mailing lists? You can manage your pairList mailing lists by going to your mailing list's administrative interface. See how to do this in our article, How do I get to the pairList Admin Interface? How do I configure authorized sender addresses? Authorized senders are email addresses that are automatically approved to post to the mailing list. If you try to post to a list without first being a member or an authorized sender, your post will automatically be rejected. For instructions on how to add authorized senders to your pairList mailing list, see our article, Setting Up pairList Authorized Senders. The last three formats include the name "John Doe" with the subscription. The formats can be intermixed in one mass subscribe. How do I send HTML messages? You can send HTML encoded messages with pairList, but there are a couple of restrictions. First, the archiver system strips out HTML code from archived mailing lists and only shows the plain text portions of the post. The pairlist archiving system provides a link to the HTML portion of the post, which display the HTML tags. This functionality only affects the pairList archives and not the actual messages sent to the mailing list. Second, headers and footers do not get added to HTML messages. pairList sends headers and footers as an attachment to HTML posts. To prevent this action, you should edit the header and footer information in the Digest and Non-digest options. Lastly, you would want to increase the "max_message_size" value for HTML messages as HTML messages are usually larger than text messages. You can find this setting on the "General Options" page under the Additional Settings section. The setting is called "Maximum length in kilobytes (KB) of a message body. Use 0 for no limit." To send an HTML post to your pairList, you must set your email reader to compose messages in HTML format. Consult your email reader documentation for details on composing HTML messages. You can then simply send the message to the pairList mailing list as normal. Is there additional documentation for administrators? If you haven't found the answers to your questions, you can learn more about administering pairList mailing lists by reviewing the Mailman software documentation. Why don't I see my own posts to the list? A common complaint of Gmail users is they don't see their own messages that they posted to the mailing list appearing in their inbox, even with the option to receive their own messages enabled. The cause is that Gmail de-clutters the inbox by discarding duplicate messages based on message-id. Mailman does not modify the message ID even though it may add footers or strip attachments. Gmail sees this identical message ID and discards it. It's not even visible in the All Mail folder. You will only find that message in your "Sent Mail" folder in Gmail showing that you did successfully send it. There's no workaround as Gmail considers this a feature and has no option to disable it.